Hidden Veggie Teriyaki Meatballs are one of those perfect kid friendly dinner ideas – sweet, savory, and secretly good for you! 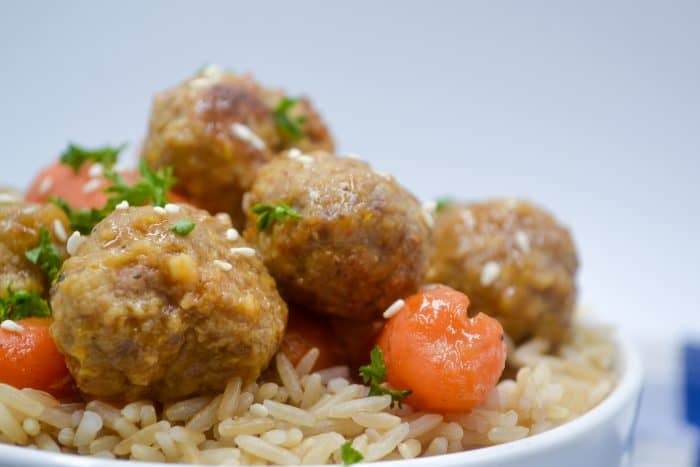 These Asian inspired meatballs bring big flavor in a simple 30 minute meal. Your kids will love the kid friendly approach – meatballs in a teriyaki sauce packed with pineapple is bound to entice them! – and you’ll love that you’re encouraging them to eat more veggies without the battle. There are a few staple foods in our home – anything pizza related, tacos and quesadillas, meatballs and pasta, and Asian food (most preferably rice). If you have or had a 3 year old, this is probably exactly what you expected. My oldest will try just about anything when you put it into these forms. A few weeks ago I was trying to figure out what on Earth to make for dinner when I got a random craving for Hibachi – you know, the Japanese steakhouse places that cook your meal right in front of you? It’s seriously my favorite and usually my birthday dinner request. Given that it was a random Wednesday, there was no way I was going to pack up 2 hangry kids, beg the husband to go, and spend an ungodly amount on dinner. (okay, so I totally did consider it.) I needed a way to make something to squash the craving at home. Preferably, ina quick, healthy, kid friendly fashion. Did I mention that I snuck in veggies to add some extra goodness to this meal? My kids didn’t even notice, which is why I absolutely love hidden veggie recipes. Grate your hidden veggies on the finest shred to hide them best. If you plan on using something like zucchini but think your kids will be put off by the green, try peeling it before you shred. Try hiding veggies in puree form in things that are already family favorites – adding peas and spinach to my family’s favorite creamy pesto pasta sauce is always a win! When serving hidden veggies, I like to also serve a small portion of the hidden veggie in plain view. If they don’t eat it, that’s fine, but it helps them to expect a veggie with a meal and you also have the chance of an added exposure of that vegetable. 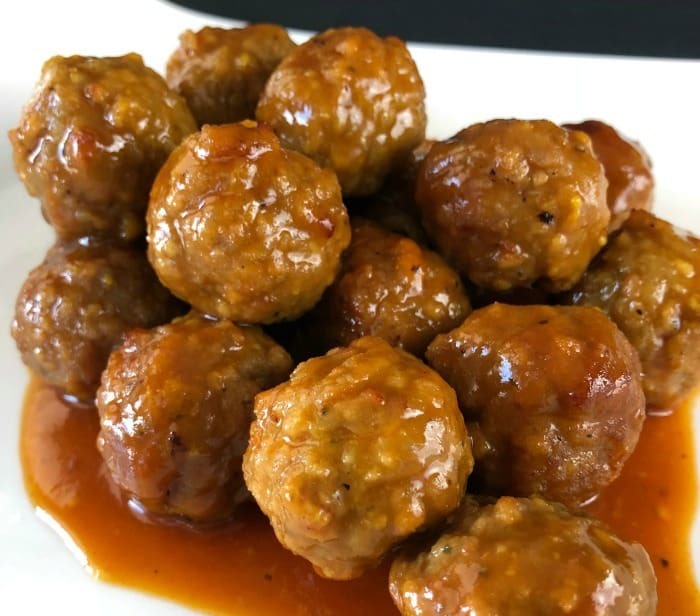 These teriyaki meatballs are one of my favorite kid friendly dinner ideas – kids love the meat balls and sweet flavor of the pineapple sauce, while you can enjoy the fact that the meatballs are packed with veggies. Customize them to fit your families needs and wants – you can use zucchini or shredded carrot in place of the yellow squash. Instead of turkey, try ground chicken, pork, or beef in place. The shredded vegetables help keep the meatballs super moist, so they are more forgiving to overcooking and lower fat meats. 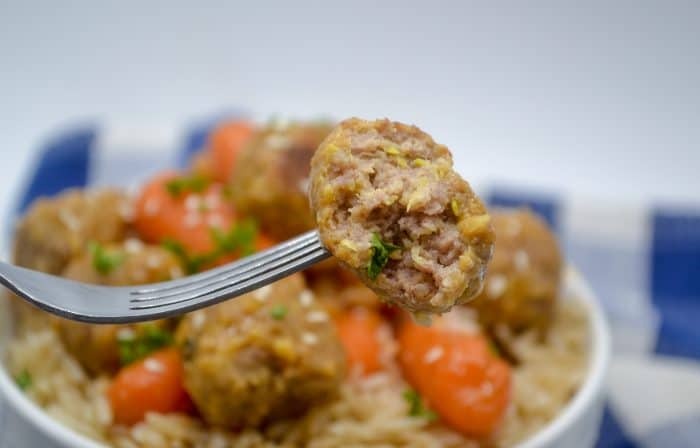 Hidden Veggie Teriyaki Meatballs are one of those perfect kid friendly dinner ideas - sweet, savory, and secretly good for you! 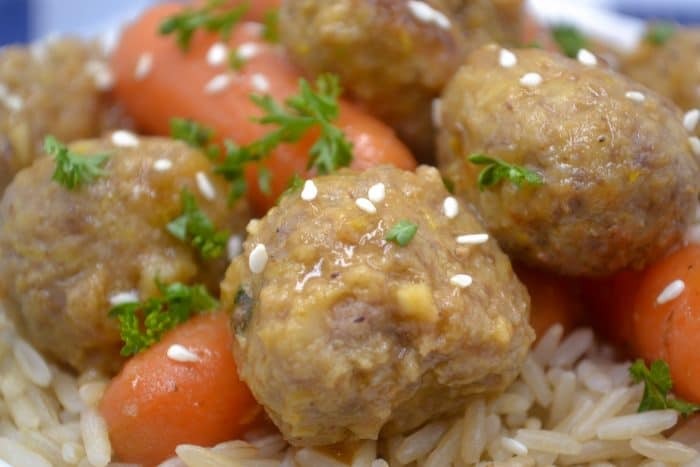 These Asian inspired meatballs bring big flavor in a simple 30 minute meal. Preheat oven to 400 and prepare a large oven safe skillet with the oil. Combine all ingredients except for the meat and oil into a large bowl until everything is moist. Add meat and mix thoroughly. Portion into small meatballs, about 1 tbs each in size. Place into skillet. Bake for 20 minutes, flipping halfway through. While they are baking, remove fruit from the juice (save the juice!) and chop to your desired size. Remove the meatballs from the pan and put the pan on the stove over medium high heat. Add chopped garlic and saute for about 30 seconds, until fragrant. Add 1 cup of the chopped pineapple (save the rest for on top of yogurt or in smoothies!) and saute about 2 minutes. 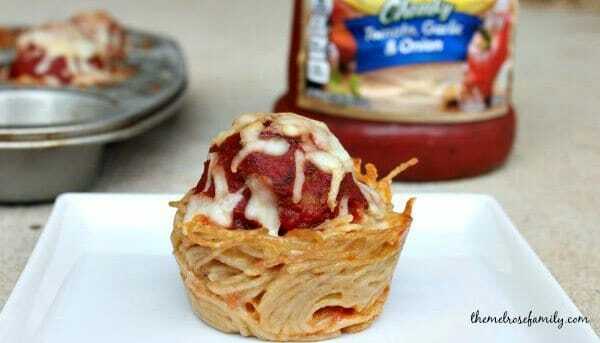 Add the rest of the ingredients and cook for a minute before adding the meatballs back in. Cook another minute or two, and then serve over rice and sprinkle with sesame seeds and chopped cilantro or green onions if desired. 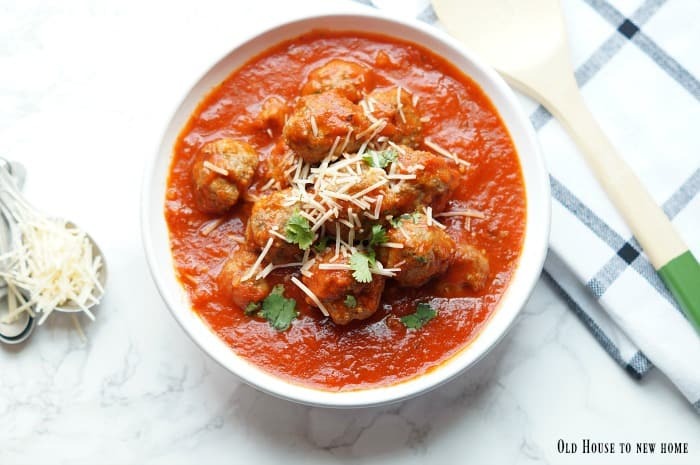 -Feel free to play with the meat used - hidden veggie meatballs tolerate lean meats well since the veggies add a lot of moisture. -Sesame oil is totally optional, but adds a ton of flavor. If you regularly cook Asian food, definitely grab a small bottle. Use sparingly as the flavor is huge. Looking for more easy ways to get kids to eat fruits and vegetables without the struggle? Find 10 healthy snacks for kids in my eBook, Eat the Rainbow! With 10 different fun fruit and vegetable snacks in every color under the rainbow, you’ll be able to outsmart any picky eater into trying something new. Morgan strives to make being a mom simple and being a kid memorable through realistic parenting advice you won’t roll your eyes at and fun food your kids will actually WANT to eat. A Target loving, stay at home mom to two crazy little boys, you can find Morgan on her blog, Morgan Manages Mommyhood whipping up simple healthy food for picky eaters and laughing over spilled milk. 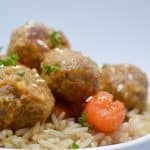 If you liked this Hidden Veggie Teriyaki Meatballs recipe you might also like…. From left to right: Best Italian Meatballs, Mini Meatball Spaghetti Pies & Meatballs in Crockpot: Bourbon Style.